Generally speaking, investors are bullish about Brazil. 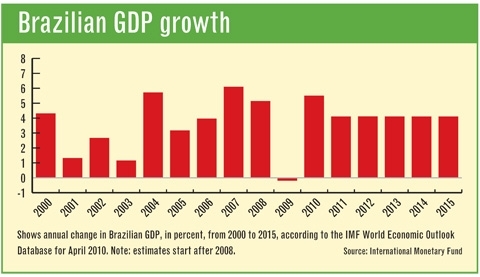 The emerging market superstar emerged from the credit crisis essentially unscathed, and some believe that “Brazil will be the world’s fifth-biggest power by the next decade.” This year, the IMF is forecasting GDP growth of 5.5%, while the Central Bank of Brazil is projecting 6%. But this post isn’t about the economy of Brazil. It’s about its currency, the Real. To put it mildly, investor sentiment surrounding the Real is slightly less rosy. 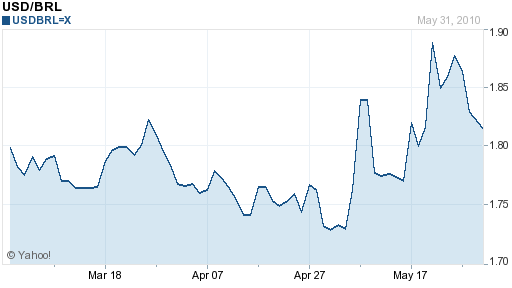 The 30% appreciation (from trough to peak) against the Dollar has come to an end. “ ‘Buyers are exhausted. The real has been a pretty crowded trade and what’s happening is a lot of these long-term crowded positions are getting sold,’ ” summarized one money manager. There are a handful of issues. First is the technical concern that the Real simply rose too far, too fast. “The currency’s weekly TD Sequential indicator suggests an almost yearlong rally against the dollar ended in October, while the moving average convergence/divergence, or MACD, chart shows the real is likely to weaken. ‘A new trend has started and it’s strongly bearish.’ ” This notion is supported by an explosion in the so-called risk-reversal rate on the Real, in favor of options that give investors the right to sell. In fact, “insurance” on the Real is now the most expensive of any emerging market currency. Investors are also nervous about the sovereign debt crisis in the EU, and are responding by temporarily moving funds back to safe haven currencies. “ ‘We’re seeing a lot of declines on top of concerns about Greece and Europe. Flows will come back to Brazil when you have signs of stability out there, and it doesn’t look like that will happen in the short term.’ ” Of course, this is also impacting the carry trade, as investors re-examine their models governing the trade-off between risk and return. To be fair, increased risk could be accompanied by increased returns. Even withstanding a poor performance by the Real, itself, the benchmark Brazilian Selic rate stands at a healthy 9.5%. In all likelihood, it will be hiked past 10% next month, and to 11% by the end of the year. On the flipside, inflation is also surging (5.5% at last count). From the standpoint of investors, this is not really a concern, since there is no intention of using invested capital for consumption purposes. In fact, it could even be seen as positive, insofar as it will force the Central Bank of Brazil to continue to be aggressive in conducting monetary policy. There seems to be a slight dichotomy between the data and the markets. On the one hand, there is plenty for investors to be excited about when looking at Brazil. On the other hand, the reality is that there just isn’t much excitement at the moment being channeled towards the Real. If interest rates continue to rise, and the debt crisis in Euro can achieve some kind of (stopgap) resolution, perhaps this will change.